Kinesiology instructor Kara Witzke will co-teach a fall workhop focused on healthy aging. 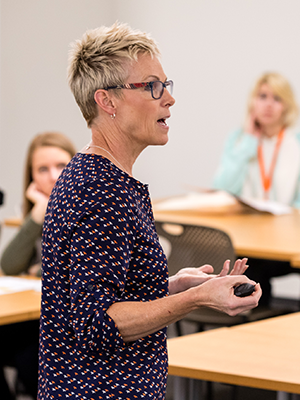 Oregon State University – Cascades will offer community learning workshops this fall geared toward personal and professional development. The workshops were designed by OSU-Cascades faculty and campus experts. Community members, as well as business and nonprofit professionals, counselors, human resources managers, nonprofit board members, seniors and others are invited to register beginning September 13. Individuals who have not previously taken courses at OSU-Cascades can initiate the process sooner by first applying to OSU-Cascades. This workshop will provide a full overview of starting a nonprofit, from registering with appropriate agencies, to understanding federal and state regulations, to board development and fundraising strategies. This professional development opportunity is exclusively for practicing counselors, and will focus on tools and innovative ideas that can bring new energy to a counseling career. This workshop will focus on team motivation, accountability, financial management and member retention and recruitment, as well as cultivating and maintaining an effective board of directors. This workshop will explore whether hallucinogens are on the precipice of a similar transition as marijuana, moving from demonization to legalization in a span of 25 years. It will also explore the “high” of hallucinogens, health impacts and history of drug regulation. Geared towards business, nonprofit and government employees, this workshop will develop skills that encourage “design thinking” and an organizational culture that can quickly develop and implement a process, product or service. This exploration of aging -- biological, social and cultural -- will emphasize the importance of exercise and nutrition habits, and how to slow the progression of conditions such as cardiovascular disease and osteoarthritis. Designed for human resources managers, this workshop will help attendees ensure fair and legal hiring practices. Topics include diversity, microaggressions, implicit bias and search advocacy. To learn more or register visit www.osucascades.edu/community-learning or call 541-322-3100.